It's snowing and cold today where I live. These conditions create a stubborn glaze of ice on the cars parked outside. The sounds of frantic scrapping on the windshields ricochet through the neighborhood. In our haste to get on our way, we tend to clear a peephole through the ice just large enough to see ahead. Yet, such a strategy is dangerous. It limits our field of vision and diminishes our capacity for strategic response. It's a quick fix with potentially devastating results. Today's hyper accelerated, disconnected world can quickly ice our souls. Yet we tend to navigate through it with only a peephole of vision. As a result, we steer our way through contemporary life with a limited perspective, a diminished response, and a deflated spirit. A more expansive sight line is needed to keep our souls thawed and our lives expansive. Have you ever had a conversation that went far deeper than the words spoken or an experience where you felt you had participated in something sacred–that you had been part of the unbidden activity of a reality much more expansive than yourself? If so, you are experiencing life beyond the peephole. 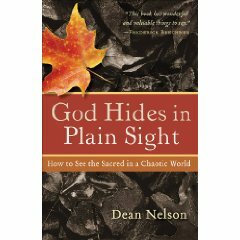 One of the more significant resources I found to scrape ice from my soul and broaden my vision is the book "God hides in plain sight: How to see the sacred in a chaotic world" by Dean Nelson. In this colorful, story-driven introduction to sacramental living, Nelson offers human beings a way to see the presence of God amid the chaos and acceleration of every day life. An expansive life beyond the peephole. That's the way to go!